Leaving Marrakech, Ramsay, Dave and I crossed over the Atlas Mountains and through the rocky, splintered, dry terrain on the other side. After 600km on the road, we left our 4×4 at Merzouga and hired some camels. We had reached the Sahara. 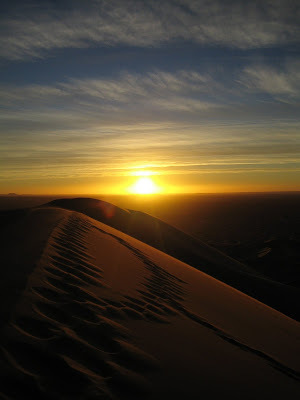 As the sun slowly fell from the sky we kerchunked – as good a description as I have for the ungainly movement of a camel – through the light brush and gravel, over the first humps of sand and into the dunes proper. The nature of a dune makes it inherently difficult to judge its size. From afar the dunes looked large, but with each minor dune scaled, the ones further off perceivably grew. With a sore behind – I’m sorry, camels just aren’t comfortable – we made it to the foot of one of the largest dunes, some 200m high, and chucked our packs into the small Bedouin shelter which we would call home for the night. As darkness took hold and the stars came out, we set our sights on the summit of our sheltering dune. After half an hour of two-steps-forwards-one-step-back, calf-twanging climbing, we made it to the peak. It was worth every step. A full moon had risen on the horizon and lit up the desert with its eerie, gloomy shadow. Below, the small lights of the camp and beyond that, just sand and rock as far as the eye could see. It is hard to beat the top of the Saharan dune with two buddies and the man in the moon, but getting back down ran it close. Our short-lived serenity was discarded for the unexpected thrills of dune bounding. Yup, head down the steep face and… jump. Lunge after lunge with increasing chaos, culminating in a face plant on the desert floor. A few hours shut-eye was curtailed for a second climb. Out of the tent still in a dream, we trudged up the other side of the dune. Steeper this time, we criss-crossed up, made it to the crest and tottered our way to the summit. We had made it just in time and the evening’s vista was surpassed. On one side, the moon dived for the skyline. On the other, a pin-prick of light pierced the Algerian horizon as the sun rose. The planetary bodies which dominate our lives came and went in unison. 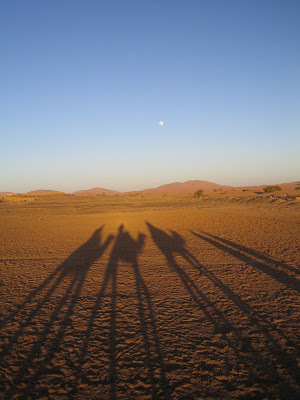 Perched on a long, thin ridge, the sand blew into our eyes as the desert lit up. With every degree the sun rose, the multitude of shadows shifted in emboldening colours. This desolate place became a palate for the sun. Before we departed for some more dune-bounding, we welcomed an inspiring visitor. 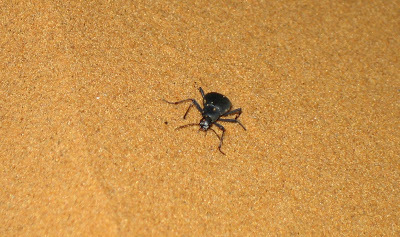 Breaking through the sand at the very peak, a small dung-beetle waddled his way in search of sustenance. He found none and had nowhere to go but down. Life perseveres through the extremes.